Lock in a great price for Quamby Homestead – rated 8.4 by recent guests! The location was beautiful. Very peaceful. The owners were lovely. There was plenty of provisions for breakfast. The bed was comfy. Comfortable bed, nice room. Beautiful garden surrounds. Good customer service. Everything was fantastic. We'll stay there again. Everything was perfect!! Peaceful, tranquil with 1st class facilities and welcoming host. Would highly recommend for overseas visitors - Australia Felix. the whole property is stunning and lived up to all expectations, including the very generous breakfast and snacks! Quamby Homestead This rating is a reflection of how the property compares to the industry standard when it comes to price, facilities and services available. It's based on a self-evaluation by the property. Use this rating to help choose your stay! 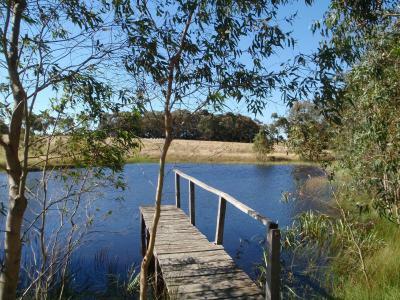 Surrounded by lovely gardens, Quamby Homestead offers a relaxing getaway in a secluded location in South Western Victoria. It offers rooms with a flat-screen TV and guests enjoy free WiFi in public areas. The air-conditioned rooms include a flat screen TV, refrigerator, toaster, microwave and an electric kettle. Each room has a private bathroom with a hairdryer and free toiletries. Self-contained accommodations options are also available. Some accommodations includes free breakfast. Quamby Homestead is 25 minutes’ drive from Warrnambool and a number of beaches including Killarney Beach and East Beach in Port Fairy. Melbourne is a 3-hour drive away. Breakfast is served in the privacy of your room. Options include cereals, fresh bread, yogurt, a range of spreads, fruit, juice, tea and coffee. This property also has one of the top-rated locations in Woolsthorpe! Guests are happier about it compared to other properties in the area. This property is also rated for the best value in Woolsthorpe! Guests are getting more for their money when compared to other properties in this city. When would you like to stay at Quamby Homestead? This air-conditioned room features a flat-screen TV, a refrigerator, microwave, toaster, and tea and coffee making facilities. This air-conditioned cottage features lovely garden views and a flat-screen TV. It also has a microwave, a toaster, a refrigerator, microwave, toaster, and tea and coffee making facilities. Please note that the price is based on 2 guests. Maximum occupancy is 3 guests, including a maximum of 2 adults (see Hotel Policies). This self-contained, air-conditioned house features a private patio with lovely garden views. It also has a fully equipped kitchen and a living room with a flat-screen TV and a DVD player. Breakfast is not provided. Quamby Homestead (circa. 1888) offers beautifully restored guest accommodation set on 3 acres of stunning English botanical gardens. Relax strolling through the gardens or take a 2 km bush walk around the property where you may spot kangaroos, wallabies and koalas. Children can also feed and pet the pet lambs, chickens, dogs and cats that reside on the property. 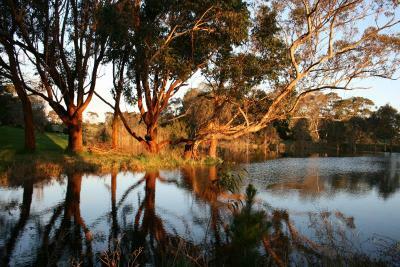 Quamby Homestead offers a truly unique and tranquil getaway- just 25 minutes from the Great Ocean Road! House Rules Quamby Homestead takes special requests – add in the next step! One child from 3 to 12 years is charged AUD 25 per person per night in an extra bed. Quamby Homestead accepts these cards and reserves the right to temporarily hold an amount prior to arrival. Please note that Quamby Homestead Hotel Bed & Breakfast does not accept payment with American Express credit cards. It was a nice country garden but not the special garden it sounds like in the description. There were things to do like fish in a dam and a pool table and a table tennis table. It would be good with children and a group. The wifi was only available in 1 spot on the verandah of the homstead. We enjoyed noy having service however may be an issue for some people. Room was nicely presented but gloomy and spiral stairway to lounge/television area was not friendly from anolder traveller's perspective.